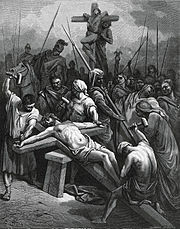 The crucifixion of Jesus occurred in 1st-century Palestine, most likely between AD 30 and 33. 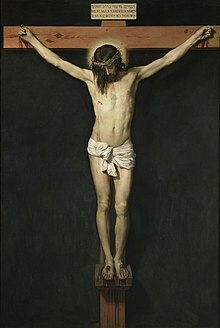 Jesus' crucifixion is described in the four canonical gospels, referred to in the New Testament epistles, attested to by other ancient sources, and is established as a historical event confirmed by non-Christian sources, although there is no consensus among historians on the exact details. 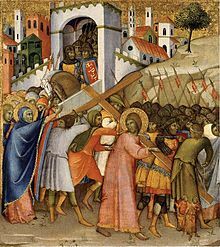 Calvary as an English name for the place is derived from the Latin word for skull (calvaria), which is used in the Vulgate translation of "place of a skull", the explanation given in all four Gospels of the Aramaic word Gûlgaltâ (transliterated into the Greek as Γολγοθᾶ (Golgotha)), which was the name of the place where Jesus was crucified. The text does not indicate why it was so designated, but several theories have been put forward. One is that as a place of public execution, Calvary may have been strewn with the skulls of abandoned victims (which would be contrary to Jewish burial traditions, but not Roman). Another is that Calvary is named after a nearby cemetery (which is consistent with both of the proposed modern sites). A third is that the name was derived from the physical contour, which would be more consistent with the singular use of the word, i.e., the place of "a skull". 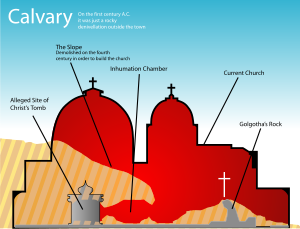 While often referred to as "Mount Calvary", it was more likely a small hill or rocky knoll. Some Christian writers considered the possibility that pagan commentators may have mentioned this event, mistaking it for a solar eclipse – although this would have been impossible during the Passover, which takes place at the full moon. Christian traveller and historian Sextus Julius Africanus and Christian theologian Origen refer to Greek historian Phlegon, who lived in the 2nd century AD, as having written "with regard to the eclipse in the time of Tiberius Caesar, in whose reign Jesus appears to have been crucified, and the great earthquakes which then took place". And they said we have killed the Messiah Isa son of Maryam, the Messenger of God. They did not kill him, nor did they crucify him, though it was made to appear like that to them; those that disagreed about him are full of doubt, with no knowledge to follow, only supposition: they certainly did not kill him. On the contrary, God raised him unto himself. God is almighty and wise. 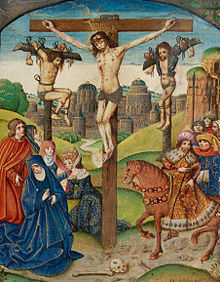 Manichaeism, which was influenced by Gnostic ideas, adhered to the idea that not Jesus, but somebody else was crucified instead. :41 Jesus suffering on the cross is depicted as the state of light particles (spirit) within matter instead. 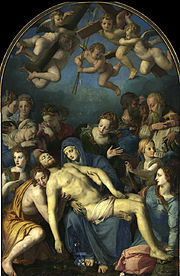 The presence of the Virgin Mary under the cross[Jn. 19:26–27] has in itself been the subject of Marian art, and well known Catholic symbolism such as the Miraculous Medal and Pope John Paul II's Coat of Arms bearing a Marian Cross. And a number of Marian devotions also involve the presence of the Virgin Mary in Calvary, e.g., Pope John Paul II stated that "Mary was united to Jesus on the Cross". 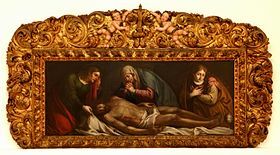 Well known works of Christian art by masters such as Raphael (e.g., the Mond Crucifixion), and Caravaggio (e.g., his Entombment) depict the Virgin Mary as part of the crucifixion scene. ^ Matthew 27:33 – "place called Golgotha (which means Place of a Skull)"; Mark 15:22 (same as Matthew); Luke 23:32–33 – "place that is called The Skull"; John 19:17 – "place called The Place of a Skull, which in Aramaic is called Golgotha"
^ Matthew 27:37 – "This is Jesus, the King of the Jews. "; Mark 15:26 – "The King of the Jews. "; Luke 23:38 – "This is the King of the Jews." Some manuscripts add in letters of Greek and Latin and Hebrew; John 19:19–22 – "Jesus of Nazareth, the King of the Jews." "... it was written in Aramaic, in Latin, and in Greek." ^ a b c "Niswonger "which meant Friday" – Google Search". ^ Cyclopaedia of Biblical, theological, and ecclesiastical literature: Volume 7 John McClintock, James Strong – 1894 "... he lay in the grave on the 15th (which was a 'high day' or double Sabbath, because the weekly Sabbath coincided ..."
^ "Blomberg "Wednesday crucifixion" – Google Search". ^ Eucherius of Lyon. "Letter to the Presbyter Faustus". Archived from the original on June 13, 2008. The three more frequented exit gates are one on the west, another on the east, and a third on the north. As you enter the city from the northern side, the first of the holy places due to the condition of the directions of the streets is to the church which is called the Martyrium, which was by Constantine with great reverence not long ago built up. Next, to the west one visits the connecting places Golgotha and the Anastasis; indeed the Anastasis is in the place of the resurrection, and Golgotha is in the middle between the Anastasis and the Martyrium, the place of the Lord's passion, in which still appears that rock which once endured the very cross on which the Lord was. These are however separated places outside of Mount Sion, where the failing rise of the place extended itself to the north. ^ "Charlton T. Lewis, Charles Short, A Latin Dictionary". Perseus.tufts.edu. Retrieved January 15, 2019. ^ "The Spirit saith to the heart of Moses, that he should make a type of the cross and of Him that was to suffer, that unless, saith He, they shall set their hope on Him, war shall be waged against them for ever. Moses therefore pileth arms one upon another in the midst of the encounter, and standing on higher ground than any he stretched out his hands, and so Israel was again victorious" (Epistle of Barnabas, 12:2–3). ^ "What is Galilean Aramaic? | The Aramaic New Testament". Aramaicnt.org. March 31, 2015. Retrieved January 15, 2019. ^ Richard Watson. An Apology for the Bible: In a Series of Letters Addressed to Thomas Paine. Cambridge University Press; March 29, 2012. ISBN 978-1-107-60004-1. p. 81–. ^ John Yueh-Han Yieh, One Teacher: Jesus' Teaching Role in Matthew's Gospel Report (Walter de Gruyter, 2005) page 65; Robert Walter Funk, The acts of Jesus: the search for the authentic deeds of Jesus (Harper San Francisco, 1998) pages 129–270. ^ "The Search for the Physical Cause of Christ's Death BYU Studies". Archived from the original on February 10, 2009. Retrieved January 20, 2009. 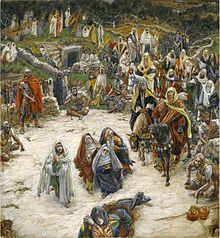 ^ The Physical Death Of Jesus Christ, Study by The Mayo Clinic Archived January 31, 2009, at the Wayback Machine citing studies by Bucklin R (The legal and medical aspects of the trial and death of Christ. Sci Law 1970; 10:14–26), Mikulicz-Radeeki FV (The chest wound in the crucified Christ. Med News 1966; 14:30–40), Davis CT (The Crucifixion of Jesus: The passion of Christ from a medical point of view. Ariz Med 1965; 22:183–187), and Barbet P (A Doctor at Calvary: The Passion of Out Lord Jesus Christ as Described by a Surgeon, Earl of Wicklow (trans) Garden City, NY, Doubleday Image Books 1953, pp 12–18, 37–147, 159–175, 187–208). 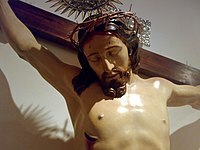 ^ "From-a-Medical-Point-of-View/Page1.html Jesus' Suffering and Crucifixion from a Medical Point of View". Southasianconnection.com. April 7, 2007. Retrieved January 15, 2019. ^ Retief, FP; Cilliers, L. (December 2003). 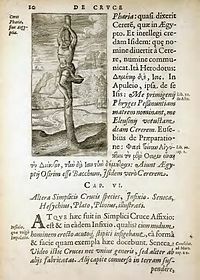 "The history and pathology of crucifixion". South African Medical Journal = Suid-Afrikaanse Tydskrif vir Geneeskunde. 93 (12): 938–41. PMID 14750495. Retrieved November 3, 2018. ^ "Miserentissimus Redemptor". Encyclical of Pope Pius XI. Archived from the original on August 12, 2014. ^ "Vatican archives". Archived from the original on May 2, 2008. ^ "Metropolis – Japan Travel: Jesus in Japan". Web.archive.org. Archived from the original on August 25, 2006. Retrieved January 15, 2019. ^ Bartlett, Duncan (September 9, 2006). "Programmes | From Our Own Correspondent | The Japanese Jesus trail". BBC News. Retrieved January 15, 2019. ^ "Jesus In Japan – FT110". Web.archive.org. Archived from the original on March 10, 2007. Retrieved January 15, 2019. ^ "The Little-Known Legend of Jesus in Japan | History | Smithsonian". Smithsonianmag.com. January 1, 1970. Retrieved January 15, 2019. ^ "Mary was United to Jesus on the Cross". EWTN. November 1, 1995. Retrieved January 15, 2019. ^ "Vatican website on Behold Your Mother!". Archived from the original on May 17, 2009. Retrieved February 19, 2009. Schneemelcher, Wilhelm; Maurer, Christian (1994) . "The Gospel of Peter". In Schneemelcher, Wilhelm; Wilson, McLachlan (eds.). New Testament Apocrypha: Gospels and related writings. New Testament Apocrypha. 1. Westminster John Knox Press. pp. 216–227. ISBN 978-0-664-22721-0. Retrieved April 25, 2012.